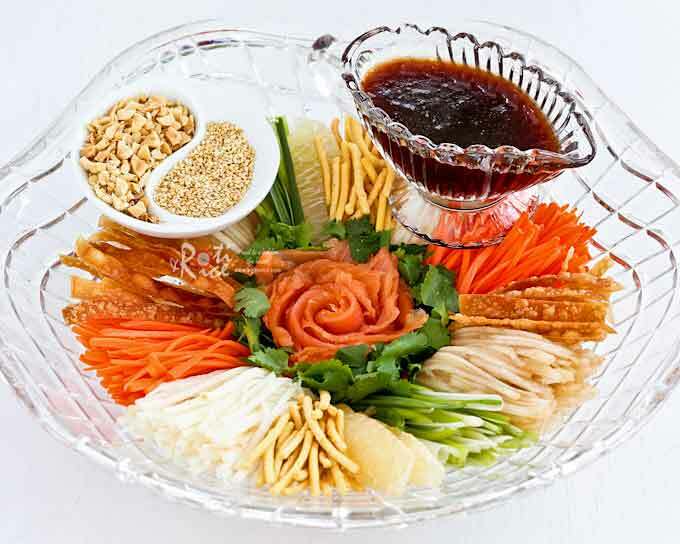 Back in the “old” days, Prosperity Toss Salad (Yee Sang/Yusheng) was only served on the 7th day of Chinese New Year known as Human Day (人日 / rén rì). This is the day everyone is supposed to grow a year older. Hence, the Chinese assumes an additional year in age during the New Year. Today, Prosperity Toss Salad (Yee Sang/Yusheng) is served way before the Chinese New Year right through the 15 days of celebrations. This is because serving this dish is a lucrative business for restaurants and people are willing to pay for the experience. In Malaysia, this dish can run in excess of RM100.00 for grated vegetables and a few pieces of fish! That said, there are very few restaurants outside of Malaysia and Singapore that serves Yee Sang. Our only option then is to prepare it at home, which really is not hard to do. There are no hard and fast rules on what fruits and vegetables should be on the platter. As long as you think they look and taste good together, almost anything goes. Jicama and carrots are mainstays. 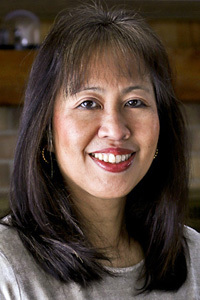 I like to add cilantro for color and pomelo which I associate with Chinese New Year. Fried wonton wrappers and taro strips are are often used as the crunchies. When it comes to the “fish”, salmon and abalone are popular choices. This year, my intention was to prepare a Pau Sang (with abalone) instead of Yee Sang (with fish). Unfortunately, I was not able to get canned abalone and so I am back to using smoked salmon. I prefer to use smoked salmon (lox) as it is safer because I can’t get sushi grade salmon. 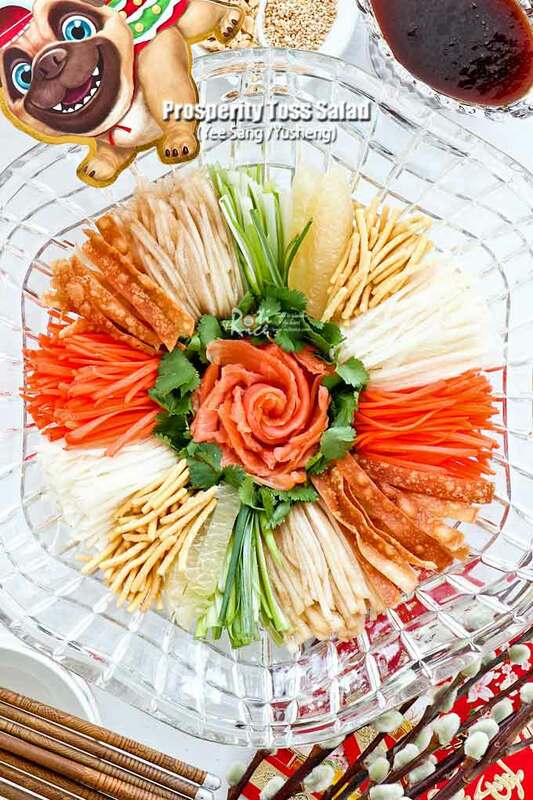 I do think lox works really well and have been using it for all the years I have prepared Yee Sang here in the US. Cut wonton wrappers into strips. Keep them as straight as possible straight. Deep fry until golden brown. Remove and drain on paper towels. Arrange smoked salmon into a strip. Roll the strip to form a “rose”. Place in the center of platter. Drizzle lime juice over it. 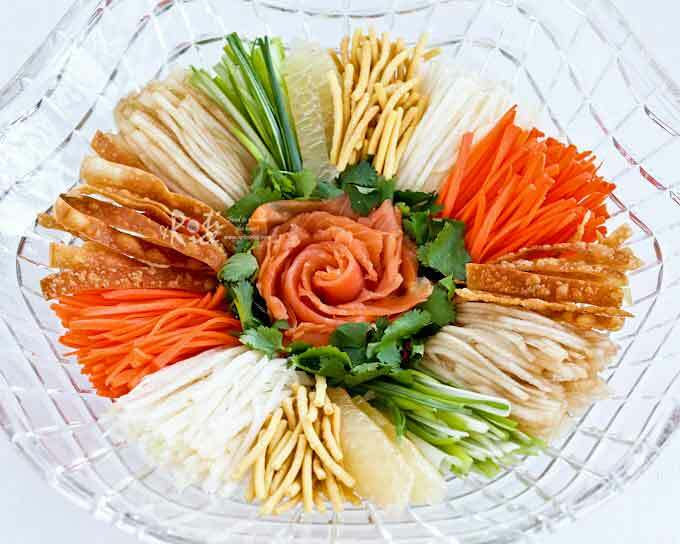 Cut pear, jicama, carrots, and green onions into matchsticks about 3 inches in length. Divide pear and each vegetable into two portions. Arrange each portion opposite each other on the platter. Do the same for the pomelo, fried wonton wrappers, and crispy chow mein noodles. Tuck cilantro around the salmon “rose”. Combine all dressing ingredients in a small pan over medium heat. Stir until sauces are well mixed and slightly thickened. Remove and place in a small serving bowl. Place peanuts and sesame seeds in separate small dishes. When everyone is gathered around the table, sprinkle toasted peanuts and sesame seeds over the fruits and vegetables. Also, drizzle dressing over the fruits and vegetables. Get everyone to toss the salad using chopsticks. joy, love, peace, health, and abundance!